As most of you already know from some of my previous posts and outfit shots I have been a long time fan of LAGOS. And needless to say, this holiday season's collection did not disappoint me in the very least. 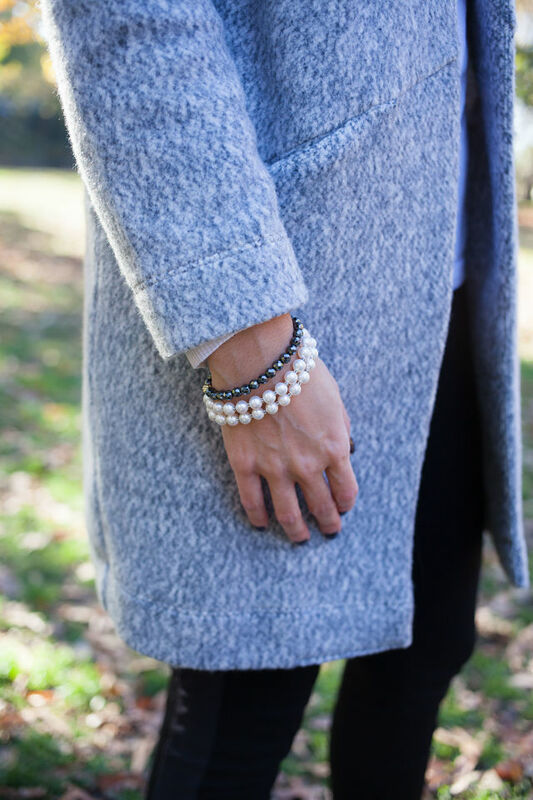 For the benefit of full disclosure, you won't usually find me sporting pearls but my Luna Pearl Double Strand bracelet was truly love at first sight. This holiday season will be the perfect time to pull out my more classic jewelry pieces -- i.e. my pearls -- to attend family gatherings, office parties and dinners and for some special occasions with my little family. I'm also looking forward to gifting two of these beauties to two very special women in my life, my mom and mother in law. I think they will be delighted to find a beautiful purple LAGOS box at their doorstep in a few weeks! And, of course, for myself, I couldn't keep it to just one LAGOS piece at a time. I paired my Luna Pearl bracelet with the Caviar Icon Gemstone bracelet since I love to stack these beauties. Some other options I love for the holidays? These gorgeous Infinity Drop earrings and the stunning Caviar Icon Caviar necklace. A girl can dream, right? Bracelets: thanks to Lagos, here and here. Eliminate the shower head medium.com/ from the hose Title or wall surface. Inside the system, search for a rubber circle or plastic Best Shower Heads That Are Worth Your Consideration or metal insert just like a filter in the hose. If your snow blower seems extremely loud, hatenablog.com use hearing protection.Snow blowers do Title require some merely normal and annual maintenance. Best Electric Start Lawn Mowers 2017 You'll intend to change the spark plug. Ladonna's Cleansing Service's group is hard working , good cleaners, responsible, immediate, honest and total nice to have around. Furthermore, to use usually once more the very subsequent day. I knew every little شركة تنظيف مسابح بالرياض thing that was posted, all I really wished was to learn was about bonding and insurance. Specialized service contracts: service. Green House and Office is a cleaning service in Bethesda that covers all the Washington metropolitan space شركة تنظيف فلل شمال الرياض. See if The Maids Cincinnati services your space by click to see our map or checklist of cities and zip codes. personnel. The latest collection surprises with its bright and at the same time low-key details. The accessories look even more interesting due to the refinement of color.